Imaged by Edward Liske from a ferry on route Bellingham, WA to Ketchikan, Alaska. ©Edward Liske, shown with permission. A smooth sea or lake acts as a mirror to reflect sunlight upwards. To a raindrop, there appears to be two suns - one above the horizon and a second an equal distance below. Each sun produces a separate set of primary and secondary rainbows. Those for the light reflected from the sea/lake,'reflection bows', have their centre above the horizon. They intersect the 'normal' rainbows at the horizon. 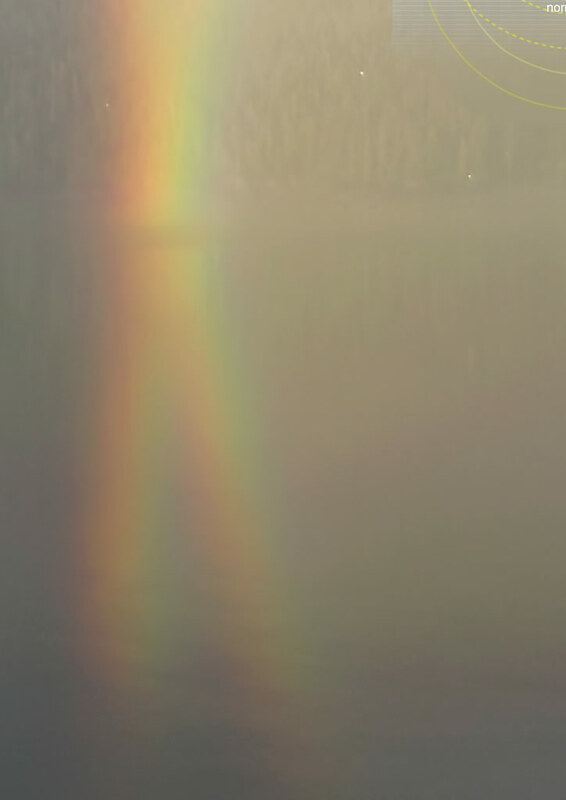 Rainbows below the horizon arise from more complicated ray paths and are called 'reflected' and 'reflected reflection' bows.